Trees require certain nutrients in order to function and grow. Most trees in urban landscape settings are grown in soils that do not contain sufficient nutrients for it to grow and develop properly. This is why fertilization is a very important part of tree care and tree preservation. We frequently remove fallen leaves, organic matter and other potential sources of nutrient recycling that would naturally have helped trees thrive. 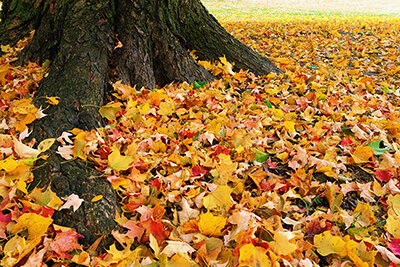 Fertilization can replace these soil nutrients lost by leaf cleanup. Tree fertilization can also help new trees expand root systems for better anchorage and overall vitality. Expanded root systems mean better water absorption and better defense against drought and hot weather, which has become more common here in the Pacific Northwest. For those who want that instant screen, fertilization will increase plant growth. What’s the Difference Between Deep Root Fertilization and DIY Fertilization? So, what’s the difference between deep root fertilization and DIY fertilization sold in stores? Most store bought fertilizers (especially for lawns) are quick release nitrogen that are high in salts. The salt can cause “fertilizer burn” which results in scorched leaf margins. Deep root fertilizer is a slow release, zero salt formula, that does not burn or cause drought stress for the tree. Injecting into the soil brings the nutrients to the root zone of the tree and helps deliver more fertilizer directly to the tree. This is especially good for trees in grass and planting beds where competing plants may absorb some of the fertilizer. It’s important to know what type of fertilizer will give the right balance of nitrogen (N), phosphorus (P) and potassium (K). This can be confusing for many homeowners. Our tree specialist takes the guesswork out of what fertilizer blend is best and handle everything for our clients. For more information or if you have questions about deep root fertilization, call us at (360) 563-2700. Nancy Penrose is owner of Big Trees Inc. (https://bigtreesupply.com/), (tree nursery Snohomish, WA), one of the largest Seattle tree nurseries, specializing in large trees for sale and transplant tree service. Learn more about tree preservation at https://bigtreesupply.com/tree-care-maintenance/ and for more tips on tree care or installation go to privacytree.net. See our video at https://www.youtube.com/watch?v=A6vVhNW1XJI and connect with us on Facebook at https://www.facebook.com/pages/Big-Trees- Inc/193731105108.